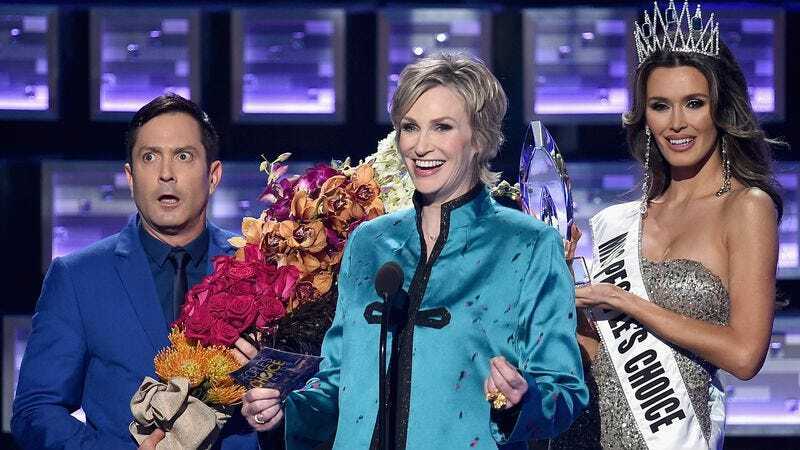 America’s fondness for TV shows that have been around a long time shone brightly, as The Big Bang Theory won both best TV show and best TV comedy, both now indisputably true facts according to the wisdom of randomly aggregated virtual crowds. Familiar pop culture faces like Melissa McCarthy, Kevin Hart, Selena Gomez, and Chris Hemsworth all took home awards, lending credence to the idea that people like things they generally like. Half of Rizzoli & Isles won ”Favorite Cable TV Actress,” though we’re not sure which half, beating out basically everyone on Pretty Little Liars, and also Hilary Duff for some reason. There were also awards for Beauty And The Beast as favorite sci-fi/fantasy show—because that idea is a perfect fantasy of its own, presumably—and Ed Sheeran and Taylor Swift won prizes, as stipulated by their contracts. Perhaps the finest trophies of the night fell under a heading called “Digital Categories,” which is apparently a way to give awards to famous people who also have Instagram accounts. Britney Spears is now the ”Favorite Social Media Celebrity,” and is someone you have heard of, and Matt Bellassai is “Favorite Social Media Star,” and is someone you have not. But let loose your bated breath, for the eagerly awaited “Dailymail.com Seriously Popular™ Award” was bestowed upon Maddie Zieglar, a kid on Dance Moms. That should probably end well, just like U.S. democracy itself.